KANSAS CITY, Mo. 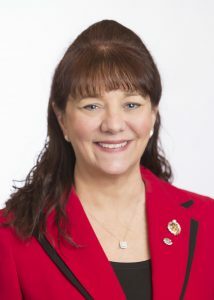 (March 18, 2019) Ann Panteleakos of Plainfield, Conn., was appointed National Secretary and elected National Treasurer of the Veterans of Foreign Wars (VFW) of the United States Auxiliary at its 2019 Mid-Year Conference in Tucson, Ariz., on Saturday, March 16, 2019. Ann is responsible for supervising the daily operation of the organization at the National Headquarters office in Kansas City. This includes administering financial affairs, clarifying Auxiliary policy and supervising eight staff members. She also serves as a liaison for the National Officers. About the VFW Auxiliary: The VFW Auxiliary is one of the nation’s oldest veterans’ service organizations and our members are the relatives of those who have served in overseas combat. We have more than 475,000 members representing all 50 states who volunteer millions of hours and give millions of dollars to support veterans, military service personnel and their families. We are a voice for veterans on Capitol Hill and are instrumental in assisting the VFW pass or block legislation that impacts veterans and their families. We are one of the top 10 providers of volunteer hours in the VA medical system. Every year, members fundraise millions of dollars for charitable projects that benefit veterans and their families. We also provide hundreds of thousands of dollars in scholarships for our nation’s youth. With nearly 3,900 Auxiliaries, there is likely one in your area working to improve the lives of America’s uncommon heroes. Learn more at www.vfwauxiliary.org.